Should You Go With a VoIP Phone System? VoIP entered the consumer realm in 1995, when the Israeli firm Vocaltec introduced its InternetPhone software. (Yes, it was popularly called the “iPhone.”) Using a PC, mic, and headphones, the “softphone” enabled conversations over packet-switched digital networks for free… sort of. Early VoIP quality was not very good. Digitized voice data gets broken into short packets for transmission over the Internet. Packets can get lost or delayed in transit, resulting in voice quality that’s choppy, plagued with gaps, or nothing at all. Obviously, that’s not acceptable for home or business calling. Many hardware vendors got busy developing VoIP gear that reduced lost packets, smoothed the flow of data, and made VoIP quality acceptable for business purposes. That tech cost a lot of money, and VoIP was adopted principally by large enterprises that could recoup its cost quickly in savings. Time and ingenuity have brought the cost of reliable, high-quality VoIP down substantially. Now, companies like 8×8 offer cloud-based VoIP services starting at just $21.99/month per line; that includes unlimited calling, voicemail, instant messaging, video calls, send/receive faxing, and a host of other business features. All you need is an Internet connection and some IP phones to plug into it. An IP phone contains all the tech needed for VoIP in the handset. Each IP phone costs about $50 to $100 depending on features such as LED display, call-routing buttons, speakerphone, and so on. An IP phone can connect directly to a router or hub, or to an Ethernet port on an Internet-enabled computer. 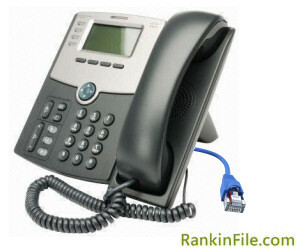 A VoIP system easily integrates mobile devices with desktop phones. Just download an app and configure it for your VoIP account. Many VoIP systems also do voicemail-to-email conversion. Users can access their voicemails, messages, and call histories though desktop or mobile app interfaces. You can even try cloud-based VoIP risk-free for 60 days, with Comcast Business VoiceEdge. It costs $29.95/month when bundled with Comcast Internet or TV; that price includes an IP phone with a next-day replacement guarantee if it fails. Vonage Business costs $39.99/month for one line; discounts are available for multiple lines. Vonage sells phones and routers made by a variety of vendors including Cisco, Sony, and Panasonic. If you’d rather own than rent a VoIP system, the Allworx Connect series of five dedicated VoIP appliances may be for you. The smallest model supports up to 20 lines and comes with two gigabit Ethernet ports. Allworx’s IP phones are optimized for best call quality with its appliances, and owning the system allows you to tweak its configuration to maintain optimal performance with the rest of your LAN. Installing a VoIP phone system can save your business a significant amount of money, as compared to traditional landline-based systems. They offer the additional flexibility of integrating mobile phones, and best of all, you cut the phone company out of the loop. « « Previous Post: Inkjet, Laser, or All-In-One Printer? How can I determine what data bandwidth (upstream and downstream) I would need per line for sound quality at both ends that is at least as good as typical wireline telephone service? I realize that I would also have to factor in other uses of the Internet connection, but I would also want to give priority to VOIP over other Internet use. …says that you need only 5-10 MBps Up and Down for 10 concurrent calls!